As experts, we know how important it is to invest in quality units both for the life of your kitchen and achieving a beautiful kitchen. Our units may appear similar to other retailers upon first glance but we have made minor tweaks throughout to make our units more robust, more attractive and more versatile. Therefore providing you with the best of British furniture. The details here, and below, highlight the importance of investing in an excellently produced unit with premium products. Providing you with the best of British manufactured furniture that will look great today and in years to come. 18mm solid tops to unit, providing extra strength and a temporary work surface. 50mm service void on all base units with 18mm solid backs. 16mm void on all wall units with 8mm solid backs. All items received with identification label with corresponding numbers. Extra durable and stable adjustable elephant feet fitted to base units. High impact 2mm ABS matching or contrasting front edges and 0.4mm PVC edging to all other cut edges. Blum Antaro grey drawers with soft close runners as standard. Upgrades available include Blum Legrabox white, grey and stainless steel or dovetail timber drawer boxes in oak, walnut and other woods. Our units come as standard with cam and dowel base units and glue and dowel wall units. We opt for this construction as on occasion we may experience access difficulties or need to modify units to accommodate soil stacks, boilers and other fixed items in your room. In addition, you can request all glue and dowelled or all cam and dowelled if you prefer. We use high-density melamine faced boards available in 257 colours, 127 of which are available as standard. We only use Egger, the brand leader in furniture board manufacture. It is a highly durable and strong material that is easy to keep clean whilst looking great. Egger are registered sustainable forestry contributors, making sure that their products have as little impact on the environment as possible. 2mm high impact ABS is used for all front edges with all other edges finished with 0.4mm, leaving no raw or exposed edges. Therefore, providing you with a highly durable, long-life unit. Durable edging to your units that can be colour matched to your unit choice, or contrasting. Unlike many other manufacturers that use a thinner edging material, 2mm edging is very unlikely to suffer peeling or chipping. We use a combination of 18mm and 8mm high density melamine faced boards for our unit backs which are edged on all sides, as are our 18mm shelves. Adding rigidity and strength to the units. Solid backs not only give your units a sturdy feel but also makes them strong and prevents warping and twisting. Blum’s latest soft closing, fully adjustable drawers, drawer runners and hinges that are all easy to remove and reattach. These high quality hinges are guaranteed against failure for 25 years, safeguarding the working parts of your kitchen. Being fully adjustable they provide a great finish to your kitchen with all doors and drawers lining up beautifully. As standard we supply 30kg runners and up to 70kg as an upgrade, dependant on the size and type of drawer. 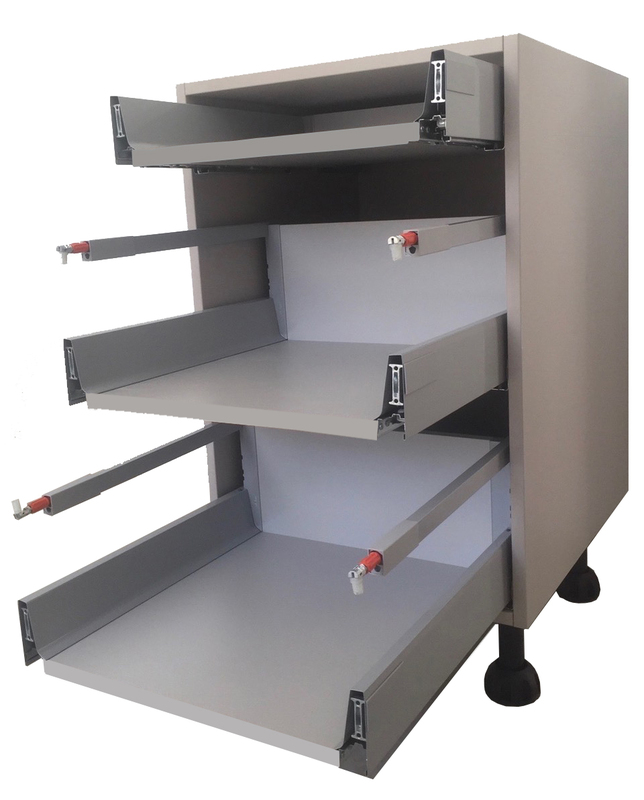 We provide three colour options for Legrabox, available in dark grey, white and stainless steel. For a small upgrade cost we have a range of solid timber dovetail drawer boxes, the most popular being oak and walnut. If you are a little more budget conscious we can supply light grey or white Antaro drawer boxes. All of which are on display in our showroom and operate on the very best Blum soft closing runners. This extra attention to detail adds a little more elegance to your kitchen whilst providing budget conscious options. All of our drawer boxes have solid bases preventing any sagging, failure or weight restrictions. We use ‘elephant feet’ adjustable legs on all of our base and tall units as opposed to the typically budget adjustable legs. These heavy duty legs are extremely strong and will provide a huge amount of strength and rigidity to your units with adjustment to compensate for any undulations to your floor. These feet will easily take the weight of any solid surface and not buckle under pressure or when moving during installation. Where possible our base units are supplied with solid tops rather than just simple rails. This creates a more solid unit and a temporary worktop that will help elevate some of the strain whilst waiting for your kitchen worktop to be fitted. Although we will be unable to install a hob or sink you will be able to prepare food, place a microwave and use a table top plug in stove if available.